Figure 5.1. Example texture image, taken with permission from the X3D Specification. Figure 5.2. 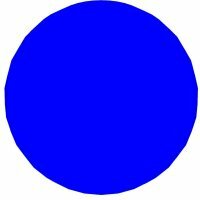 Sphere with diffuseColor="1 0 0" and no other colors specified in the sibling Material node. Figure 5.3. Sphere with emissiveColor="0 0 1" and no other colors specified. Note how emissiveColor flattens the rendering and can hide shading cues. Figure 5.4. 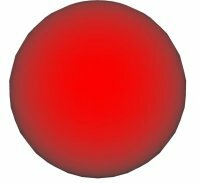 Sphere with specularColor="0 1 0" and diffuseColor="1 0 0" with no other colors specified. Note that the highlighted specular region is colored yellow, which is a combination of the green and red contributions. Figure 5.5. 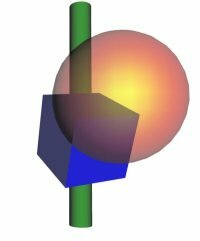 Semitransparent sphere in front of an opaque box and an opaque cylinder. Figure 5.6. 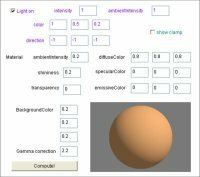 The Pellucid tool shows precise coloring for different lighting and material combinations. Figure 5.7. 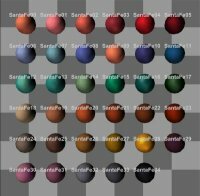 The Universal Media Materials archive provides a rich set of different materials that are easily copied into other scenes. Figure 5.8. Image texturing, using either local or networked retrieval of the image. The first image is the textured geometry, the second image shows the geometry prior to applying the texture, the third image is the texture file itself. Figure 5.9. 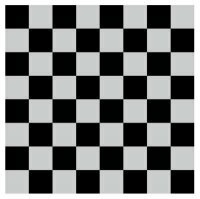 A simple PixelTexture presenting an 8 � 8 image of black and white pixels. With use of the TextureTransform node, this can be reduced to 2 � 2 pixel texture. Figure 5.10. PixelTexture producing a color image, shown on the geometric primitive nodes to illustrate mappings on different surfaces. Figure 5.11. 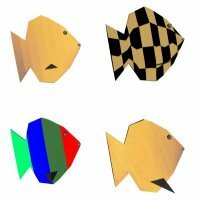 Various PixelTexture images applied to the Garibaldi fish model. The first PixelTexture defines 12 � 7 pixels. Note that stripes on the Garibaldi in the top left that has PixelTexture rather than the ImageTexture (bottom right). Figure 5.12. TextureTransform can translate a texture image (shown above) to better align with underlying geometry (shown below). Figure 5.13. 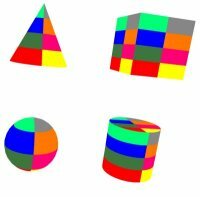 Rotation of texture coordinates works in texture coordinate space, changing the alignment of textures on the underlying geometry in the opposite direction. Figure 5.14. 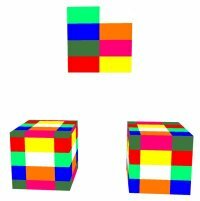 Scaling of texture coordinates can create the appearance of an 8 � 8 PixelTexture from a 2 � 2 PixelTexture. Figure 5.15. TextureTransform can translate, rotate, and scale textures in combination.